On Friday evening we took Andi to the park and then we went out to dinner. It was so much fun. I just wanted to be comfortable. So I wore this dress with sneakers. I originally planned on wearing it with boots but I love how it looked with sneakers also. 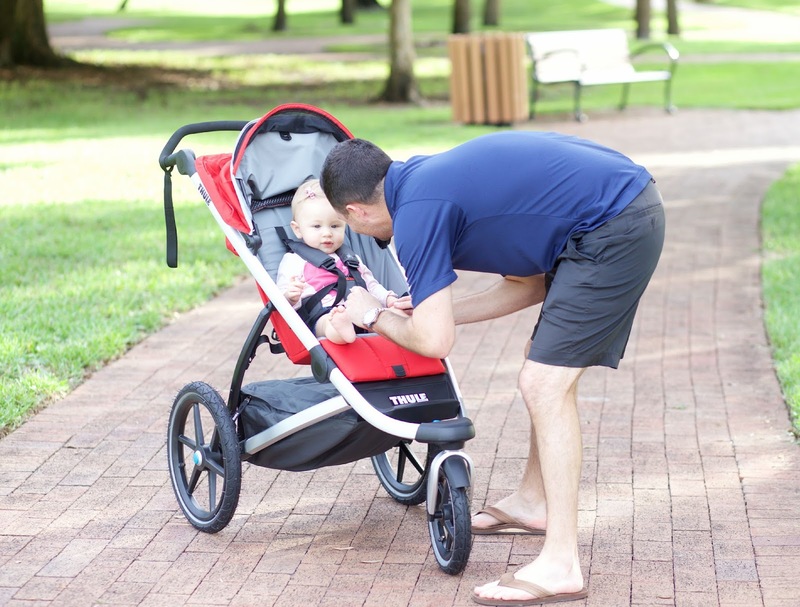 How cool is this Thule jogging stroller? I am so thankful that they sent this to me to try out! Andi really loved it. We were joking that the way she is strapped in makes her look like she is on some sort of ride. And when we would push her fast she would start laughing. It was so cute. 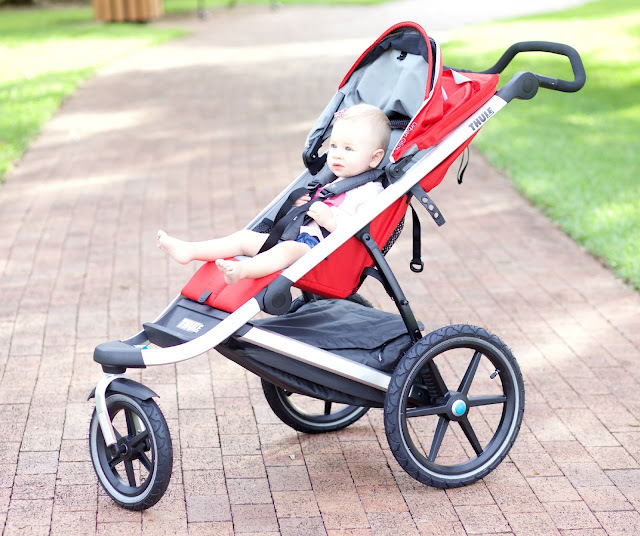 I am so excited because today on my Instagram at 10:00 I will be posting a giveaway for this Thule stroller in the color of your choice. All the requirements to enter will be listed in the Instagram post. The giveaway will run for 2 days and the winner will be tagged in the original photo on Thursday. 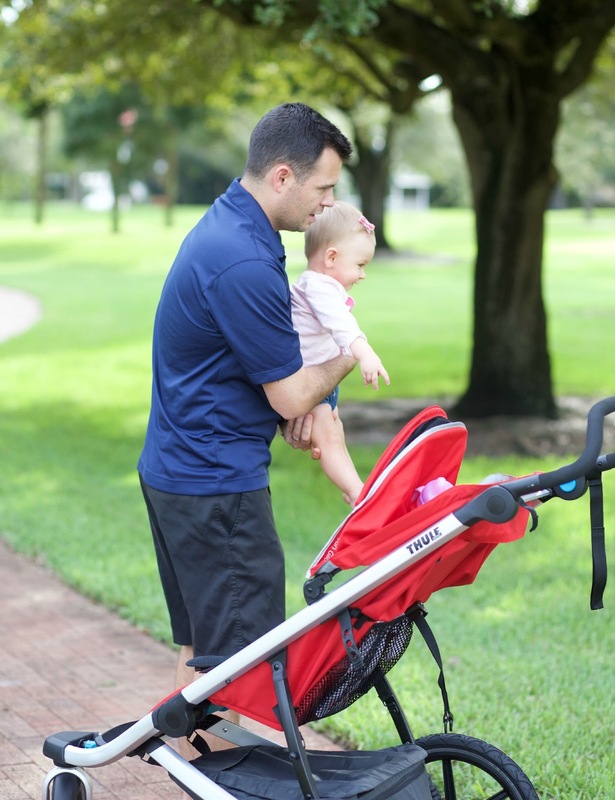 So be sure to check out my Instagram for a chance to win this cool stroller. Such cute family photos!! I love your casual dress and your cute sneakers!! First of all I love your hat! Second of all this is such a great chic meets athletic look. Those sneakers work perfectly! Nice family pictures! You look beautiful! These are such sweet photos! I love the dress! http://trendkeeper.me .. Red leopard & caged! Adorable! Loving that tied dress on you. What a pretty little girl you have! Love that dress on you! Looks so pretty with the hat and I love how you dressed it down with the tennis shoes! Hope you have a great start to your week, Jade! Cute outfit and Andi is getting so big! You guys are so cute! Love your shoes!! Loving this casual dress! So comfy and cute! The light in these photos is just gorgeous! LOVE your dress!!!! Love the dress. The stroller looks like a good one. I will have to look into this stroller.